How a Movement is Built, Barriers and Bridges Principles. As lived and reproduced by white people. From Edler's unpublished paper Distancing behaviors among white groups dealing with racism. DENIAL | denial of existence of oppression; denial of responsibility for it | Discrimination is a thing of the past. It’s a level playing field. It’s not my fault; I’m not responsible. MINIMIZATION | playing down the damage | Racism isn’t a big problem anymore. It’s not that bad. BLAME | justifying oppression, blaming the victims of oppression for it | Look at the way they act. If they weren’t so angry... Women are too emotional. LACK OF INTENT | claims the damage is unintentional | I didn’t mean it like that. It was only a joke. IT'S OVER NOW | the oppression was in the past and is no longer an issue | Slavery was over a long ago. Feminism has gone too far. COMPETING VICTIMIZATION | claiming that targets of oppression have so much power that we are threatened | Women really have all the power. We just want our rights too. They’re taking away our jobs. White people are under attack. Another resource created for white people is jona olsson's Detour Spotting, which looks at the learned attitudes and habitual behaviors birthed in white supremacy conditioning and internalizations. As lived and reproduced by white people and People of Color. From Arnold, Burke, James, Martin, and Thomas' Educating for a Change, 1991, p. 134. Our identity and relation to power: we may feel guilt or anxiety for being a member of the dominant group (a man when sexism is the issue; a white person when racism is the issue). We may be afraid to speak out because we’ll be seen as a troublemaker and become isolated when we belong to the target group. Our discomfort with the content and perspective: the implications of what we’re learning may be very threatening to us if we belong to the dominant group or may not be critical or threatening enough if we belong to the target group. Our discomfort with the process: those of us used to doing things a certain way may get impatient or frustrated when the process is unfamiliar, slow, or too ‘touchy feely.’ We may assume that the way we respond to the process is the way everyone responds to the process, whether or not that is true. Some of us feel we have a ‘right’ to be included, while others never expect to be fully included. Our fear about losing: taking in and/or acting on the information presented may mean loss – of family, of friends, of a job. A white person who opens up to how racism is playing out in their family or community may risk losing important relationships if they decide to speak or act. A person of color who decides to work in coalition with white people may risk losing important relationships as a result. Our fear of critical thinking: many of us tend to hear critical thinking as criticism. For example, the suggestion that we could do better on race issues in our organization is heard as criticism that we’re doing a bad job. This can be particularly difficult when we have a lot of personal investment in the organization or community. Living in an urgent culture and facing urgent problems in our communities, one of the challenges we face is how often we give into the pattern of moving from awareness to action without taking the necessary steps that help us to be more effective and successful in reaching our vision and goals. This diagram illustrates the steps that we need to take if we are going to be thoughtful, deliberate, strategic, and collaborative in crafting a shared vision and goals. Awareness of the problem leads to intentional time devoted to building relationships with and among communities most affected by the problem. Those people and communities then engage in information gathering and analysis in order to build a shared understanding of the problem, including an ability to distinguish between root causes and symptoms. The next stage is collaborative visioning, goal setting, and planning followed by deliberate and thoughtful action. Action is followed by ongoing reflection and evaluation so that we learn from our mistakes and build on our successes. The stages are not necessarily as clearly defined as they are shown in the diagram; for example relationship and community building can be integrated into every stage. They do inform how we think about moving forward; for example, our action will be more effective if we have taken time to gather information, analyze our situation, vision, and plan together. We also need to make sure and take time to reflect on how we're doing, what we're learning, and how our experience with relationship-building, visioning, goal setting, planning, and action has informed and deepened our understanding of how to move forward. Organizations who make a commitment to race equity move through somewhat predictable stages, illustrated in the accompanying diagram. Many organizations start their equity commitment with an already established identity as white-led, predominantly white, or operating out of a dominant white culture ideology. The organization might be operating as an all white organization, as an organization with token participation by POC who are expected to “fit in” to existing white dominant culture, or as a multicultural organization that appreciates diversity without challenging racist and/or dominant white culture practices and ideology. In this stage, all people in the organization are operating in a state of what could be called “familiar dysfunction.” Essentially, everyone in the organization has adjusted to the way the organization centers white dominant culture norms at the expense of everyone and particularly POC in the organization and/or Communities of Color served by the organization. Often (if not always), POC in the organization and those being served are experiencing levels of trauma as a result of racism and internalized racism in the larger society and in the organization. Many white people in the organization are unaware of the level of trauma POC are experiencing or if aware, are taking responsibility individually, often by separating themselves from other white people in order to position themselves as the “good” white person. People across the organization tend towards a “fixing” stance, meaning that individuals and the organization as a whole is on a mission to “fix” others, often in the name of empowerment. While individuals in the organization may be very satisfied to very dissatisfied, people have generally accepted the status quo as inevitable and have learned to function within it. As the organization begins to state an explicit commitment to race equity, equilibrium begins to shift. As people in the organization begin to develop a shared language and framework for understanding racism as race prejudice + social and institutional power, the familiar dysfunction begins to unravel. People of Color often begin to hold renewed hope that the organization might become more responsive to their strengths, needs, and wisdom; white people often begin to question what once seemed certain, particularly when it comes to their assumed power in the organization. As POC’s expectations for the organization begin to rise, particularly as a framework for racism begins to be clarified, they may assume that white people know what to do and are nonetheless choosing to perpetuate racist attitudes and behaviors. As white people sense that the framework requires some change in attitudes and behaviors, they may become either hypersensitive or hyperdefensive, particularly as they sense the expectation that they should behave and believe differently while not knowing exactly what to do. This is the beginning of a culture shift in the organization. POC often read white people’s ignorance as intentional; they may also equate race equity with the need for white people to change, which can diminish their sense of power and agency. As a result, they may feel high levels of frustration and/or hopelessness. White people often become so unsettled by no longer having power to define the organizational “norms” that they begin to take every challenge by others, whether from a white person or a POC, as very personal and begin to try to prove they are one of the “good” white people, either by disassociating from other white people, intellectualizing the process, criticizing the process, or seeking approval from individual POC. People in the organization begin to “flip the script;” the organization engages in either/or thinking that positions POC as inherently good and white people as inherently bad. At this stage, the organization tends to blame individuals for doing things “wrong” and there is little ability to hold complexity or appreciate oneself or others. This flipping of the script into either/or thinking can increase the sense of traumatization on the parts of both POC and white people, as expectations for needed and desired change are not met. This leads to the stage of “not knowing,” a place where many experience frustration and/or fear. Many if not most people want the process to offer clarity and quick fixes; when the process does not, both POC and white people give into the tendency to identify people and actions as “right” or “wrong.” Some people in the organization move into positions of high righteousness, believing that race equity is based in “one right way” of doing things; energy goes into identifying who or what is “right” and who or what is “wrong.” People can feel very unsettled because this righteous judgment can either lead to significant self-doubt and/or a desire for the organization to address personal ego needs. At the same time, in the middle of this “not knowing,” relationships may begin to subtly shift as some individuals within the organization work to negotiate conflict with heightened personal awareness and increased accountability to the mission. In addition, the organization as a whole begins to recognize ways in which racism is tending to reproduce itself and attempts are being made to address those. At this point, the organization acknowledges that culture shift is messy and chaotic and focuses on efforts to build relational trust and a culture of appreciation to help move people and the organization through the chaos. People start to identify their individual and collective power to make change or shift the organization without focusing or depending on others to change. People continue to identify useful and/or effective ways to disagree, looking for the value in different perspectives while assuming positive intent. Caucuses provide support for people to work through challenges related to equity work. People begin to sharpen their skills for holding each other accountable with a sense of possibility rather than judgment. Both POC and white people are working to bring intention and impact closer together out of a mutual respect for the hard personal work involved in a race equity commitment. OR ... In cases where the organization is unable to hold the chaos of not knowing, it reverts to familiar dysfunction, often solidifying old patterns of power and privilege. The rationales for reverting to dysfunctional white supremacy patterns include a need for clarity (which is essentially an admission that those with power in the organization are too disturbed by changing power dynamics), urgency related to the organization’s mission (“we don’t have time for this,” “we can’t afford to be distracted,”), the need to produce measurable results for funders, among others. Some people may leave or threaten to leave the organization. While the reasons are often different, both POC and white people can become advocates for reverting to familiar dysfunction. At this stage, the organization is ready to identify and name specific and explicit race equity goals at the cultural, institutional and personal levels. Naming these goals now rather than earlier, before the culture shift and “not knowing” stages, allows these goals to address the nuance and complexities inherent in race equity work. Naming these goals now also means the groundwork has been laid for everyone to understand the integral interconnection between institutional, cultural, and personal work. Once goals have been clarified, the organization leans into the equity work with an appreciation for complexity, ongoing learning and reflection. The organization works to establish a culture that provides support and accountability, one that presumes good intent while continually improving on the effort to bring intent and impact closer together through improved communication and mutual respect. The organization understands race equity as an ongoing practice rather than a specific destination. People have learned how to offer appreciation, disagree, make mistakes, call into account, reflect and revise. People have also learned to identify their individual bottom lines and know when and how to stand their ground while remaining accountable to the organization’s vision and mission. There is no such thing as a single-issue struggle because we do not lead single-issue lives. 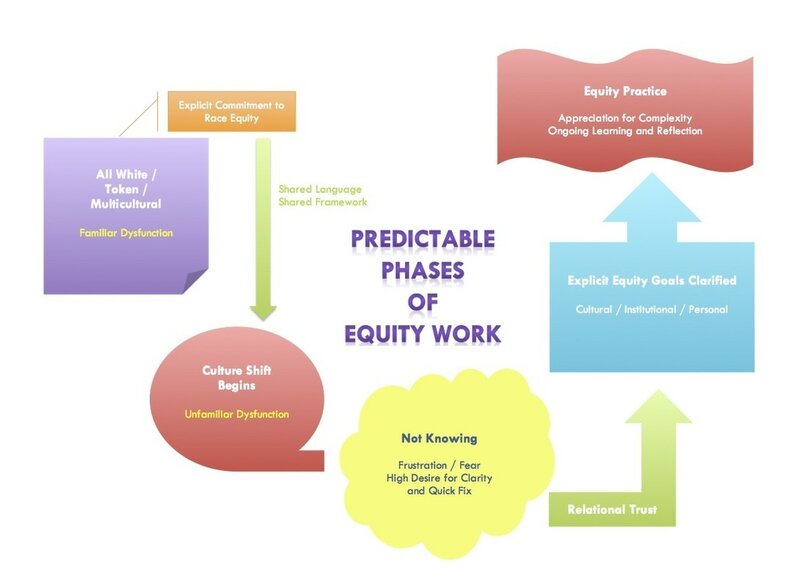 This graphic illustration of the stages of racial equity are designed and offered by Shorlette Ammons, who works with the Center for Environmental Farming Systems, a collaboration of NC State University, NC A&T University, and NC Cooperative Extension. Big thanks to Shorlette for this beautiful graphic. For best viewing, download here. Adapted from Parker Palmer's Divided No More: A Movement Approach to Education Reform. Individuals refuse to act outwardly in contradiction to something they know to be true inwardly. Groups emerge when these individuals find each other, begin to build community, and spread the word. Collective action happens when the group begins to translate individual problems into public organizing issues that address the root cause of the issue. We need an analysis of how oppression works. This is not simply about reducing prejudice. This is about radically changing the way we do things, about redistributing power. There is a difference between appreciating diversity and recognizing oppression and abuse of power. To build multi-cultural organizations, we have to build cross- cultural relationships one-on-one. In order to do that, we have to be willing to do personal work, learn more about who we are, and change. On the other hand, we can’t build multi-cultural organizations alone; we have to build a strong team of people committed to the same goal. We must be open to doing things differently, sometimes radically so, than we’ve done them in the past. We may have to redefine the very things we thought were basic. We need to learn that points of resistance, both within ourselves and as exhibited by others, are the sources of greatest learning. We must recognize discomfort as a signal for learning rather than an excuse for withdrawal or defensiveness. We need to acknowledge that we get out of this process what we put in. We must be open to learning even if it is not packaged in ways that we expect or in ways with which we feel comfortable. We must be actively engaged in the learning process. In this work we must learn to seek to understand before turning to judgment. At the same time, we can expect, and we deserve, appropriate, loving, and just behavior. Change is often experienced by those in power as moving too quickly and by those with less power as moving too slowly. Change does not need to be slow, but often is. These principles were developed by Grassroots Leadership's (Charlotte, NC) Barriers and Bridges program, a precursor and contributor to the Dismantling Racism process for which this workbook is designed. These principles speak to the assumptions and values that ground dismantling racism work.